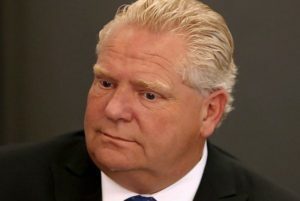 Speaking to the Rural Ontario Municipalities Association conference Monday, Ford said last week’s cancellation of a contentious section of Bill 66 is significant. “We heard you loud and clear on Bill 66,” the premier told about 1,000 rural mayors, reeves, and councillors from across the province at the Sheraton Centre convention in Toronto. “Of course, we’d never have approved any projects at the expense of the Greenbelt, water quality or public health,” the premier said. “But, as Minister Clark recently announced, we will not proceed with schedule 10 of the bill,” he emphasized. The premier also announced that Clark and Attorney General Caroline Mulroney would soon begin province-wide consultations on muncipalities’ liability.